Back in 2015, Ex Machina became a “critic’s darling”, but not one that made a big dent with audiences, as it took in a mere $25 million in the US. Still, the movie created enough buzz to earn first-time director Alex Garland a bigger budget for his next flick, 2018’s Annihilation. Based on a novel by Jeff VanderMeer, we learn that a bizarre area called “The Shimmer” has developed off a coastline, and teams that go in to research it don’t come back – mostly. Cellular biology professor/former US Army soldier Lena (Natalie Portman) happily greets the return of her husband Kane (Oscar Isaac) after his disappearance in The Shimmer, but it soon becomes clear that something about him changed. Kane goes into a coma, and project leader Dr. Ventress (Jennifer Jason Leigh) recruits Lena to join another team to re-enter The Shimmer. Hoping to find a way to help Kane, Lena agrees and finds herself ensnared in a deeper mystery. Despite the momentum from Ex Machina, Annihilation failed to find much of an audience. With a take of $32 million, it barely outgrossed Garland’s earlier film, and the suits took such a pessimistic view of the film that they didn’t even bother with a non-US theatrical release – instead, the movie went straight to Netflix outside of the States. Within the US, the ad campaign sold Annihilation as a mix of sci-fi, horror and action – all of which are true to a degree. However, audiences who expected something active and dynamic undoubtedly left disappointed, as the movie preferred a much more subdued experience than what the trailers promised. Whatever form of “bait and switch” may have occurred, I don’t mind the film’s less action-oriented approach. I don’t need Annihilation to bring me a slam-bang experience, so I’m fine with the creepy tone and “slow burn” nature of the drama. That doesn’t mean I think Annihilation works, though, as it fails to come together as a truly satisfying tale. While I appreciate its stabs at psychological terror and an open-ended motif, the end result just doesn’t connect. Some of that – actually, a lot of that – comes from the movie’s relentlessly derivative feel. With Annihilation, we get Invasion of the Body Snatchers meets The Thing meets Arrival meets Alien meets Apocalypse Now. This became an issue with Ex Machina, too, as that movie tended to wear its influences on its sleeve. However, it offered a much stronger sense of tone and a clearer narrative through-line than the jumbled Annihilation. Of course, some of those influences show greater impact than others, but the impression remains that Annihilation finds it difficult to generate its own identity. Whatever the movie wants to be, it seems reluctant to decide, so we wind up with a tale that lacks a clear impression of its own. Annihilation also gets less interesting as it goes, a pretty severe flaw for any movie. With the film’s first act, we find ourselves intrigued by a number of threads. We want to know what happened to Kane, and we want to learn more about The Shimmer. The story and characters deliver enough oomph to make us curious about those areas. Once Lena, Dr. Ventress and their cohorts enter The Shimmer, though, the movie tends to lose a lot of momentum. 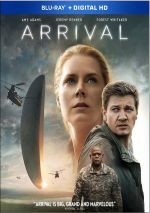 Once again, the lack of tonal consistency becomes an issue, as the movie seems unsure if it wants to become a 2001-style sci-fi exploration or more of a monster-based action flick. If better executed, it could be both, but the movie’s story fails to come together well. Sometimes Annihilation feels like a series of concert art paintings connected together without much narrative development, so it seems impressive to look at but not especially coherent. I do recognize that Annihilation remains visually impressive much of the time, with some indelible moments along the way. Whatever it does wrong, the film creates a great sense of beauty and dramatic images. Unfortunately, it can’t go much beyond that. 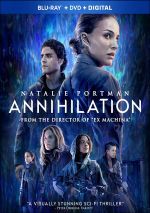 Not an especially effective blend of the different genres, Annihilation delivers a collection of creative, intriguing ideas and scenes that fails to mesh. Annihilation appears in an aspect ratio of approximately 2.35:1 on this Blu-ray Disc. An occasionally challenging image, the Blu-ray usually looked good. Softness could become a little iffy at times, largely due to the nature of the source, as the movie went with slightly soft photography. Nonetheless, most of the film offered solid accuracy, so the less defined sequences popped up infrequently. No issues with jagged edges or moiré effects materialized, and I saw no edge haloes. Print flaws also failed to appear. In terms of palette, a lot of the movie went with a dull blue impression, while scenes inside The Shimmer brought out a more green-oriented feel due to all the forest settings. While I can’t claim the hues impressed, they felt true to the production’s intentions. Blacks appeared fairly deep and dense, while shadows showed generally good clarity and smoothness. I won’t use this as a demo image, but the picture felt like a pretty accurate version of the source. Downconverted to Dolby TrueHD 7.1, the film’s Dolby Atmos soundtrack usually concentrated on atmospheric material. A movie with more of a “slow burn” feel rather than an action bent, the mix tended to focus on environmental information that filled the channels in a broad, engaging way. Music used the various channels in an involving way, and the movie’s smattering of more active sequences worked well. These created a strong impression of these scenes and added zest to the proceedings. Audio quality worked well, with speech that consistently came across as natural and concise. Music appeared strong, as the score and songs brought out warm, vivid tones. Effects also came across nicely, as these elements boasted clear information with deep, firm low-end. The generally low-key nature of the mix made it a “B”, but it seemed appropriate for the film. All of the disc’s extras consist of featurettes, and these fall within three domains. Under Southern Reach, we find “Refractions” (11:20) and “For Those That Follow” (15:04)). Across these, we hear from writer/director Alex Garland, producers Andrew MacDonald and Allon Reich, author Jeff VanderMeer, concept artist Jock, visual effects supervisor Andrew Whitehurst, production designer Mark Digby, and actors Natalie Portman, Oscar Isaac, Jennifer Jason Leigh, Gina Rodriguez, Tessa Thompson, and Tuva Novotny. “Reach” looks at the source novel and its adaptation, story/characters, visual design and effects, cast and performances. The two shows deliver a nice array of details and work well. I especially like the discussion of how the production of Star Wars: The Last Jedi impacted Annihilation. Next come two programs within Area X: “Shimmer” (12:12) and “Vanished Into Havoc” (15:03). In these, we get comments from Garland, Digby, Whitehurst, Portman, Reich, Isaac, MacDonald, Jock, Leigh, Rodriguez, Windsor location manager Damon Crane, Reich, marine coordinator Ian Creed, stunt coordinator Jo McLaren, special effects supervisor Hayley Williams, prosthetics and animatronics supervisor Tristan Versluis, stunt performer Jack Jagodka, and animatronics designer Guy Stevens. The “Area X” pieces discuss sets and locations, stunts, and effects. “Area X” continues to positive trend from “Reach” and gives us a lot more good information. Finally, we go to the two featurettes under To the Lighthouse: “Unfathomable Mind” (11:46) and “The Last Phase” (8:06). These bring notes from Jock, Garland, Whitehurst, Portman, Digby, Rodriguez, Thompson, MacDonald, Leigh, Isaac, and stunt performer Sonoya Mizuno. “Lighthouse” offers more about visual design and effects, creature design, sets, Garland’s impact on the shoot, and general thoughts about the production. “Phase” proves fluffier than the other five segments, but “Lighthouse” still completes this package fairly well. After a promising debut, Alex Garland falters somewhat with Annihilation. While the movie’s sumptuous visual style gives it a boost, the movie drags and falls short of its goals. The Blu-ray brings us largely positive picture and audio as well as an informative compilation of bonus materials. Annihilation comes with intriguing glimmers but the whole package doesn’t mesh.